My daughter adores babies. She always snuggles the baby, feeds it, wraps it in a blanket and strolls it around the house. Before taking a shower, she fills the sink with water and gives the baby a bath. And I blow-dry her damp cloth bottom and dress her in a clean paper towel diaper. Yes, the “baby” I’m referring to is a doll. Which makes my daughter a Baby Doll Mama. And me? A 41-year-old Baby Doll Grandma. It’s been a lot of fun, and I can’t stop smiling as I take in every last drop of my youngest child’s sweet imagination. It’s all I can do to not tear up because it’s so precious. “No, she was just running errands with me honey,” I fib, frantically wiping my saliva on her plastic face to cool her down. Don’t even get me started on the two American Girl dolls that are the baby’s big sisters. 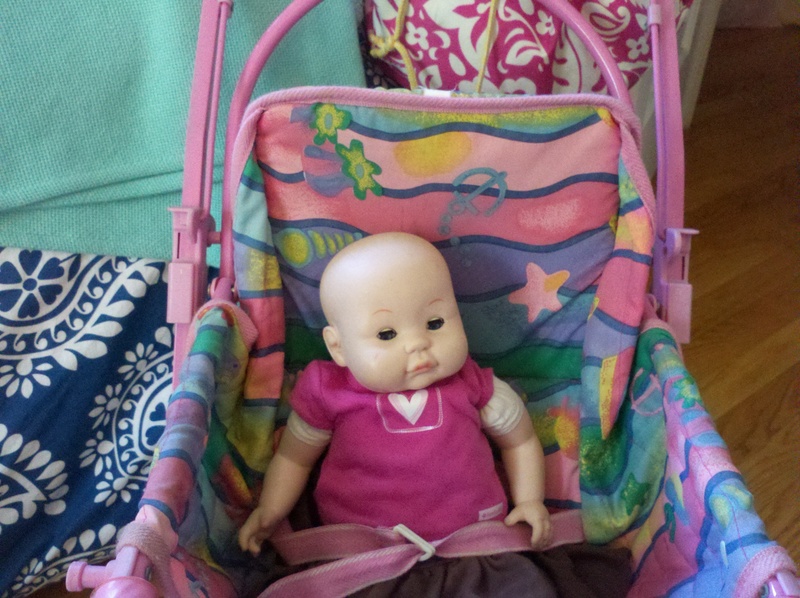 sarah’s baby is creepier than gracie bell of dillon, texas! Ha ha ha! The baby from Friday Night Lights. No, she is MUCH more attractive in person, I swear. This made me literally laugh out loud! To cute!! My youngest is the same way. I couldn’t do it. Baby dolls creep me out. Luckily I was blessed with all boys.